The new HVAC system is fully operational and all are impressed with the air quality, and how quiet the system is. 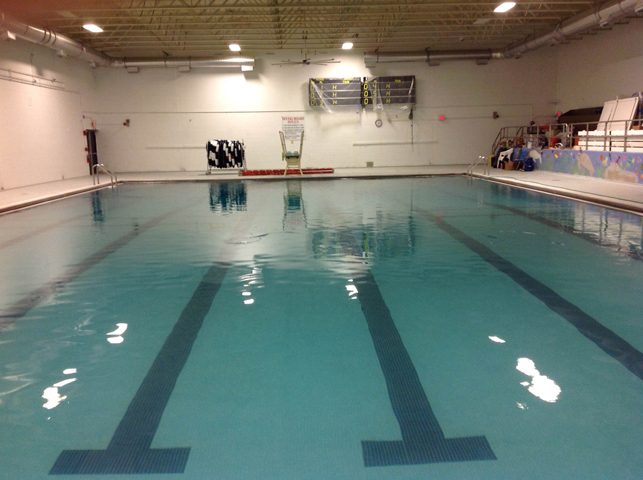 The natatorium has been painted and those who have seen it comment that it is much brighter, and the airflow has significantly reduced the odor of chlorine. As with all projects of this scope there is a “punch-list” of items to be inspected and addressed. As previously noted, an electrical inspection determined that the pool was not properly bonded or grounded to ensure the safe use of the pool. 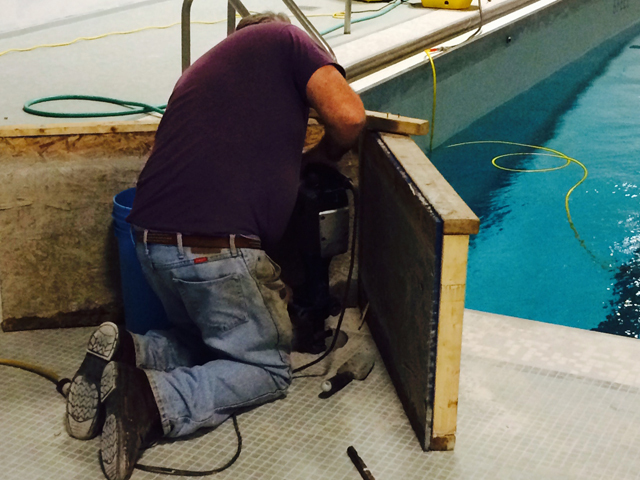 It is important to note that many of the bonding issues go back to the original pool construction. The project engineer developed a mitigation plan that was submitted, and approved by the electrical and the building inspectors. That bonding work is underway. The installation of the new upgraded starting blocks donated by the Melanson family is taking place. The new navy blue and white lane lines, also a part of their donation , are ready to go. Installing the beautiful new starting blocks! During the time the pool has been closed by the electrical inspector, the water systems were shut down and access was limited to workers only. As part of the commissioning process, this shutdown also provided the opportunity to check for any leaks, and some were found. A diver from American Leak Determination uncovered the specific areas that need re-grouting. On Tuesday, December 2, a diver from American Leak Determination, Inc conducted dye testing and determined that some grouting areas need further attention by Thompson’s Waterproofing Inc, who also had a representative on site. For our competitive swimmers and divers, dry-land training is commonplace, but nothing beats getting into the pool to swim and dive, and that is clearly a goal that we all share. Mr. Murphy is reaching out to other facilities and is working with Coach Compton to explore options, but pool access is limited. 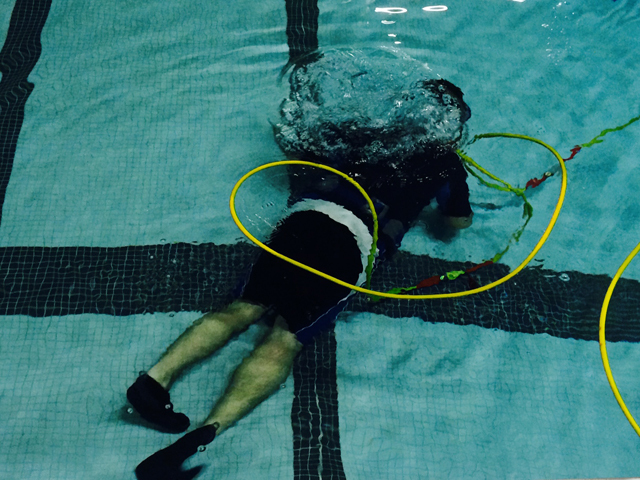 Wendy Pierce, our school Aquatics Director, has been writing curriculum for our physical education program, and she has been training our physical education teachers so they can meet certification requirements for use of the pool. I know everyone would like a guaranteed date for pool use to begin, but I can only assure everyone that the companies understand the goal and they, along with our own staff, are working hard to resolve all issues. We will not compromise on safety, or on our oversight of the work approved by the town. The current projection would have us using the pool in about two weeks time, but the building inspector has rightly declared that there will be no use until the grounding issues and any leaks are repaired. Last week’s article about the pool is here.